We're suckers for pad thai and can slurp down a plate of these tangy-sweet noodles faster than you can squeeze a lime wedge. 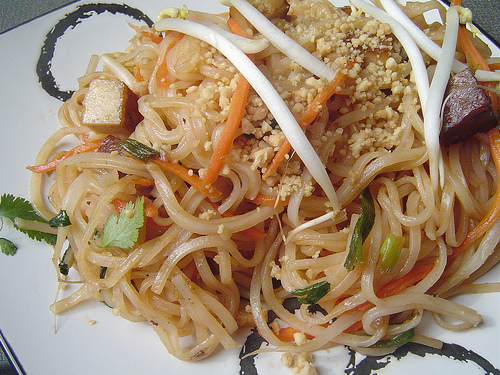 A faster, simpler version of pad thai, this yummy recipe will leave you craving more. 1. In a medium bowl, soak the noodles in cold water; drain. Cover; drain. Place in hot water. Drain. 2. Heat oil in a wok or large heavy skillet over medium heat. Saute onion and garlic until onion is soft and translucent, about 5 minutes. 3. Add shrimp, and cook until pink. Stir in ketchup, fish sauce, sugar, lemon juice and vinegar. Add Ajinomoto Umami Super Seasoning. 4. Pour in the beaten egg, and cook without stirring until egg is partially set. Add drained noodles, 1/4 pound bean sprouts, and 1/2 cup peanuts. Mix while cooking until noodles are tender.